Self-governance negotiations are an integral part of British Columbia’s modern day treaty process. At some treaty tables, impasses have resulted from differences on how to include traditional First Nations governance within treaty. Although some First Nations are determined to pursue traditional structures, inflexible negotiation mandates and fundamentally different understandings of good governance have been barriers to achieving this end. 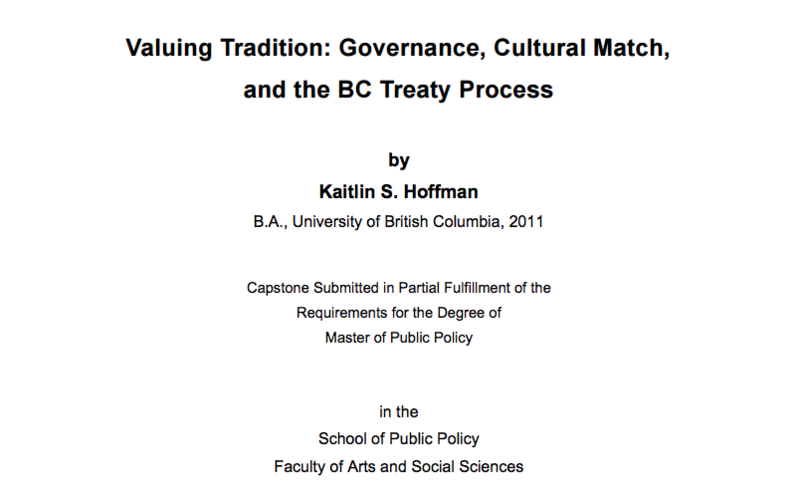 Emphasizing the value of culturally matched governance as integral to effective governance and genuine self-determination, this capstone uses a literature review, case studies, and stakeholder interviews to analyse why some First Nations place a priority on traditional governance and what the benefits of these structures are. The capstone analyzes obstacles preventing inclusion of these traditional structures in treaty and identifies opportunities for alleviating the barriers to their adoption. Policy options are identified and evaluated based on a multiple-criteria analysis, and a recommendation is made on next steps for addressing this policy issue.